Quite some time ago, I came across a recipe in a magazine that I didn’t subscribe to but magically ended up in my mailbox each month, addressed to me. It didn’t take long to realize the publication’s advertisements outweighed its content, but a two page piece featuring a local chef caught my eye as did his recipe for honey ricotta ice cream. I’m more in the chocolate camp when it comes to ice cream, but once in a great while, a lighter flavor will temp me. Rarely, if ever, will it be plain vanilla, however. Sweet cream? Yes. Cream cheese? Definitely. It made sense that ricotta and honey would appeal to me, so I tore out the recipe and recycled the magazine. The recipe sat among the other bits and pieces of paper that manage to hover near our telephone in the kitchen. When looking for someone’s number, or trying to locate a coupon, I’d see the recipe and think, “I should make this…” and place it on the counter hoping that its presence would coerce me, but it would get shoved back into the stack I removed it from, so never did. There was the small matter of not owning an ice cream maker that could also be the culprit. Not the old-fashioned hand-crank model my mother and I found at a garage sale for five bucks and which lost its novelty long ago. No, I needed an electric model I could plug in and forget. Years passed (honestly!) and I finally bought a Cuisinart with an extra freezing bowl so we could enjoy home made ice cream whenever we felt like it. Ironically, the honey ricotta recipe disappeared, most likely falling victim to one too many sessions of being shoved into a drawer and out of sight when guests were expected, and then not retrieved. It figures. But I’ve not forgotten the idea of those flavors, and so finding myself with leftover ricotta from a recent gnocchi making session, I finally decided I’d try to recreate my lost recipe. 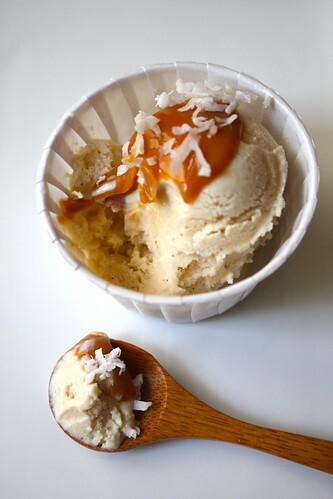 Of course all that entails is typing “honey ricotta ice cream” into my Google search box and voila! A few hundred thousand ideas are at my fingertips. Ah, but at some point, I’d decided to make gelato, so that reduced my options to just under 30,ooo. What would we do without Google? 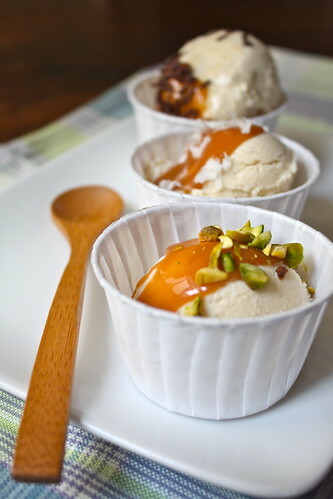 In the end, I compared three or four recipes merging a honey vanilla gelato with a ricotta gelato. And guess what? My gelato ended up with absolutely no honey in it. 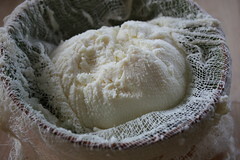 Wrap the ricotta in a few layers of cheesecloth and twist until liquid begins to seep from it. Place the ball of wrapped ricotta in a mesh strainer positioned over a bowl in the fridge over night and allow it to completely drain. Prepare an ice bath by filling a large bowl with ice and water. Have ready a second bowl that fits in the larger one with enough space for ice water to completely surround it. 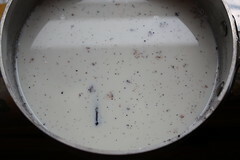 In a saucepan, mix the milk, nutmeg, split vanilla bean and its contents. Heat over low, bringing to a simmer. Discard the vanilla bean. Meanwhile, in the bowl of a standing mixer, add the egg yolks and sugar and mix on medium speed until very thick, about 5 minutes. 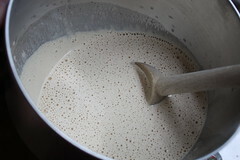 Pour about one third of the hot milk mixture into the egg mixture with the motor running. 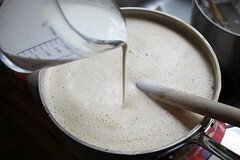 When all is combined, pour it back into the remaining milk mixture and continue to cook over low heat, stirring constantly until it’s thick enough to coat the back of a spoon. 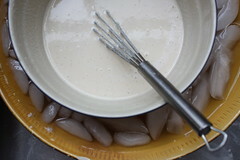 Remove the pan from the heat and stir in the cream. Pour the mixture through a fine-meshed strainer into the smaller bowl previously set aside. Place the bowl in the ice bath and stir frequently until well-chilled. Stir in the drained ricotta and mix well. Pass through the fine-meshed strainer one more time, and return to the ice bath to completely chill. You may cover with plastic wrap at this point and chill completely in the fridge if you prefer. Pour mixture into the frozen container of your ice cream maker and process according to manufacturer’s directions. 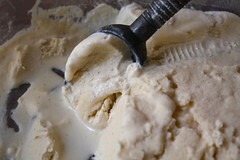 After processing, spread the gelato in a sealable container and allow to freeze for at least two hours before serving. If left longer, allow to sit at room temperature to soften a bit and then use a scoop dipped in hot water to make nice balls of gelato. 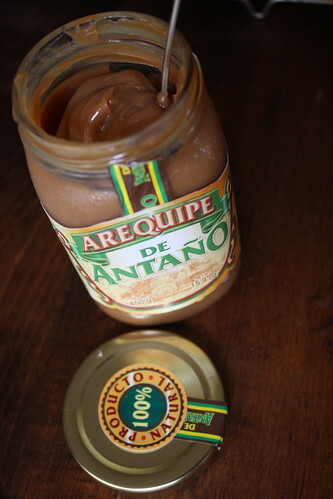 Enjoy topping it with dulce de leche (I bought mine at a local Latin American market) and a sprinkle of pistachios, chocolate jimmies, or coconut. Delicious! It makes sense that after all this time, the day I finally make something similar to that recipe I’ve lusted after my Cuisinart doesn’t work. I’d already poured the gelato into the frozen bowl, and the motor was burned out. I messed around with it long enough that the gelato had begun to freeze against the side of the container, so I inserted the paddle and pathetically began to twist it with my hand. After scraping down the sides from time to time, I was able to “churn” it fairly easily, and it actually froze fairly quickly. In the meantime, my husband had called, and so when I told him about the machine not working, he stopped on the way home to pick up another Cuisinart. I tell you. What a guy. On the gelato — and I hesitate to call it that, but do because the recipes I morphed together to arrive at my frozen conclusion were called gelato. I though gelato had less fat. Less cream. Less of everything ice cream has in it. Clearly I have more research to do. Sure, this has more milk than cream, but 5 egg yolks? That’s quite a few. Speaking of egg yolks, I freeze them when I’m using whites for other recipes, so had a nicely labeled bag with just the right quantity needed. They thaw very quickly at room temperature. Some of you may grumble about the texture of this. The ricotta, even strained, has texture. I’m wondering if truly fresh ricotta would be the same? Probably not. I guess that gives me another reason to get honey and ricotta in an ice cream, right? This recipe was inspired by one lost torn out recipe, Honey Vanilla Gelato from Taste and Ricotta Gelato from Martha Stewart. Cute little wooden spoons, Joyce Chen. Cheap.